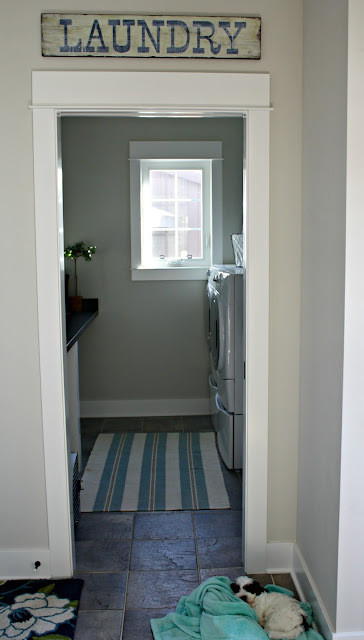 I think I promised you last week I’d show you my laundry room (ok so it was 3 weeks ago!) but then laundry day rolled around and there were piles of clothes everywhere which you don’t really want to see. Buddy enjoying some laundry fresh out of the dryer. I keep extra cleaning rags to wipe Buddy’s muddy paws in basket 01 and my camera stuff in 02. Did I mention that our laundry room is command central for us? We each have our own file space. Even Buddy has his very own personal food tins. 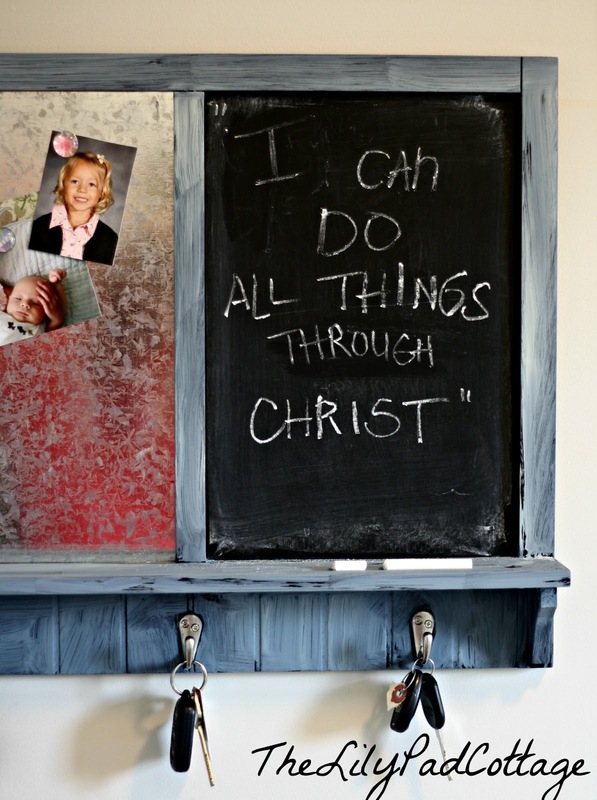 A place for our keys, and the Sunday school verse of the week. This board keeps me organized all week. I painted it blue and added some empty frames to add a little more fun. I always write our menu out so I remember what I need to defrost or grab from the store. I have a little spot for my magazines at the end of my long folding counter, I like to sneak some reading in while I wait to switch out the laundry. I got this shelf and everything on it from Home Goods. This room is still a work in progress, this is poor Buddy’s blah little spot right now, but I have grand plans for a built in doggy bed and a better recycling area than these ugly old bins. Stay tuned for part 2, but not anytime soon…remember my 32 zillion other blog ideas? Looks like a very efficient spot! Good luck with Buddy and your rug! You really used your space wisely! 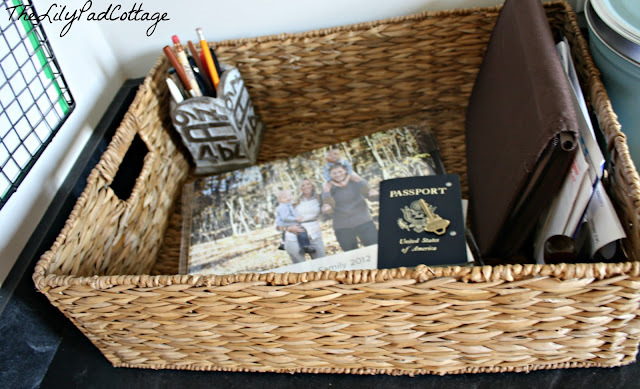 It looks so cute, too…I love all of the baskets and your framed board with the little frames. What a fantastic idea! You did a great job, even with the floors! Your laundry room looks great and so functional a t the same time! beautiful space! I am obsessed with your command central. The frames were a great idea! Your laundry space looks just perfect:) Those tiles look great and I like the addition of baskets, the home goods shelf, and you love the rug. Your puppy is so cute. I have two dogs.. and live in the pacific northwest where it’s always muddy, wet, and icy in the winter. I go through SO many towels drying the dogs off! Congratulations on getting this done. We are DIY-er’s and I can appreciate the time and effort required to to these projects! Oh Kelly, it all looks so pretty and organized! Your command central is AWESOME! I love the frames and that sign! Good luck with Buddy! Everything looks perfectly organized! Love it!! Love this! I need some serious help in my laundry room- pinning and hoping I can get hubby to agree to some of these changes! So pretty! I love the white board idea. 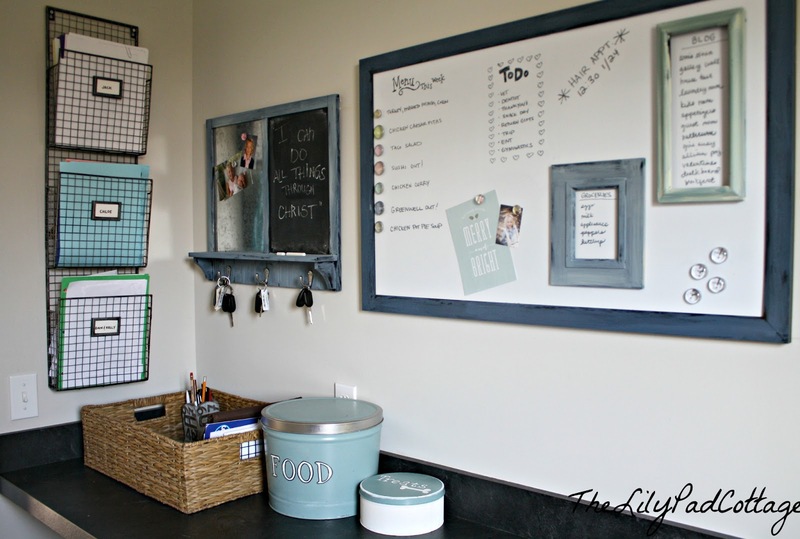 Our laundry room is in a part of the house away from the kitchen but maybe a good spot for my kids chore charts! Love the colors you selected too! our Laundry room is gorgeous and functional! I am so impressed! Please tell me WE are going somewhere exotic!! 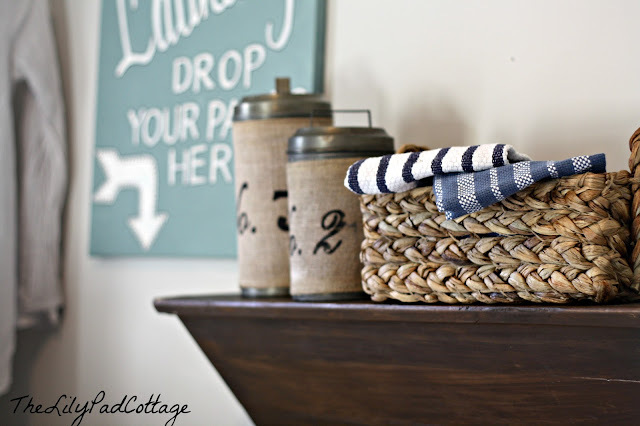 Love your nice sized laundry room and all the details. yayyy Kelly! 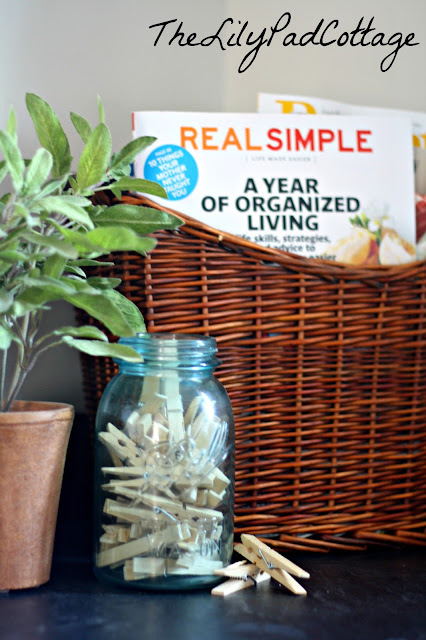 I LOVE it – it’s so pretty and organized and functional. And your command center is fabulous! So glad you shared it! I love it!!! It looks amazing and the organizaton/to-do area is a brilliant idea. 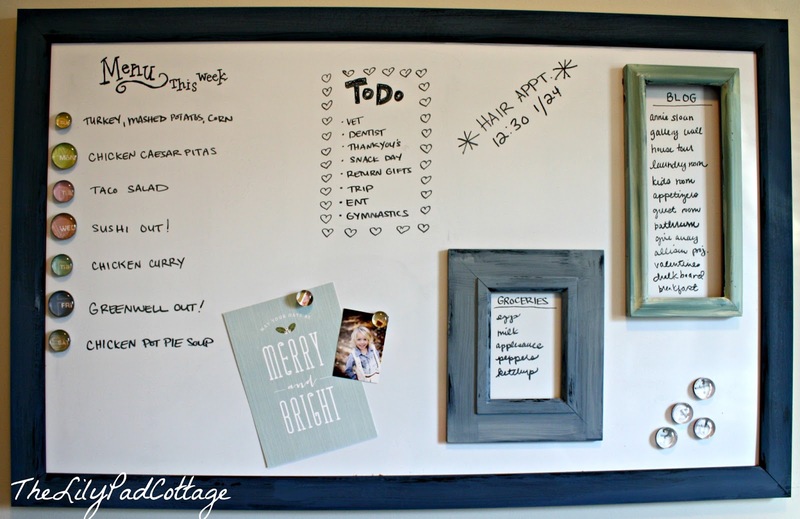 Love the picture frames on your white board. Beautiful. I love it. And I can’t wait to find out where you are going! Such a pretty laundry room! I love all the organizational stuff in there too! What a brilliant idea! Gorgeous – and since I know where you’ll be escaping to – wishing you fun! Kelly, I just started a Blog 2 weeks ago. I would be thrilled if you came for a visit, I could use any input from the Pros I can get. Love that room! I really like that your command center is in there too … I may need to revamp my room now! Love your laundry room! You are super organized. I wish I had just a little bit of organization. I am always all over the place. Gad to have found your blog over at Linda’s.Newest Follower. 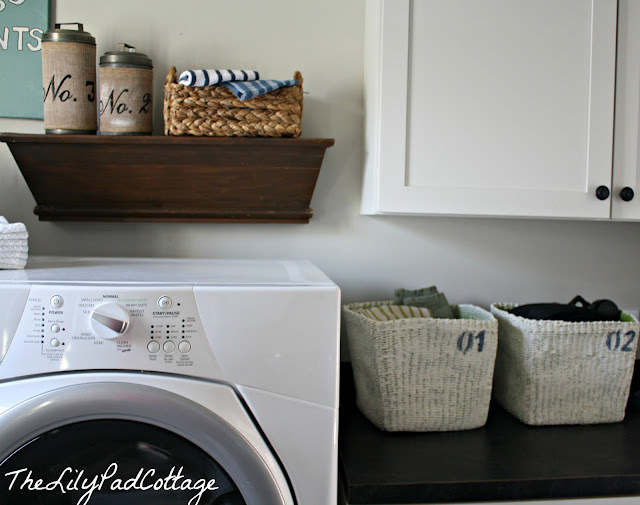 Love your laundry room…so pretty and organized. 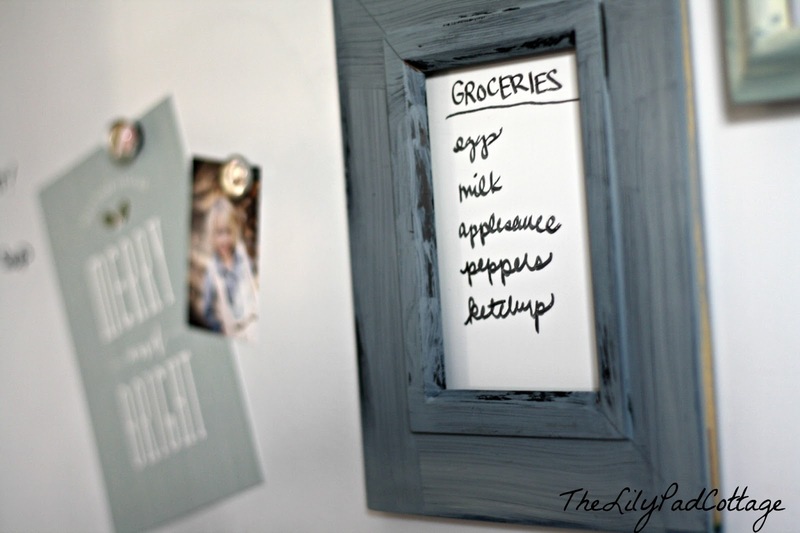 I love that you have a white board with lists and reminders in there….what a great idea! It looks beautiful! So pretty and organized! My Laundry room is on my to do list!! Yours looks so amazing! Wow! I wish I had a nice laundry room. Mine is the dreaded unfinished basement that looks like a dungeon. Nice job. I am hosting a link party and would love it if you would check it out. Thanks. Great room! 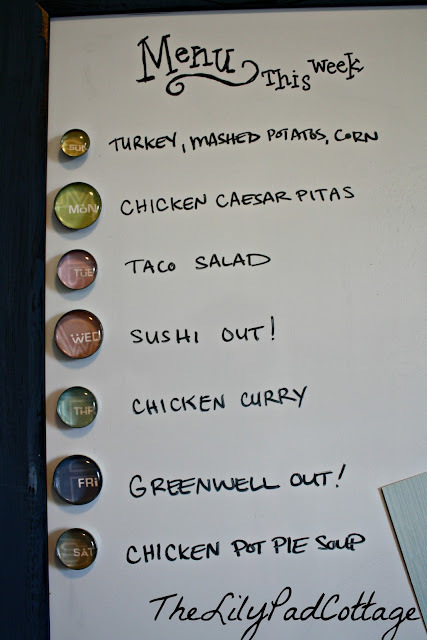 Where did you get those really cute day of the week magnets that you show on the board with the menu? What a beautiful laundry room! I wouldn’t even mind doing laundry there. Awesome command center too! I’d love it if you linked this to my new linky party, “What We’ve Accomplished Wednesdays.” It is live right now. Wow, you are one organized girl! Love it. Buddy seems to love it also! 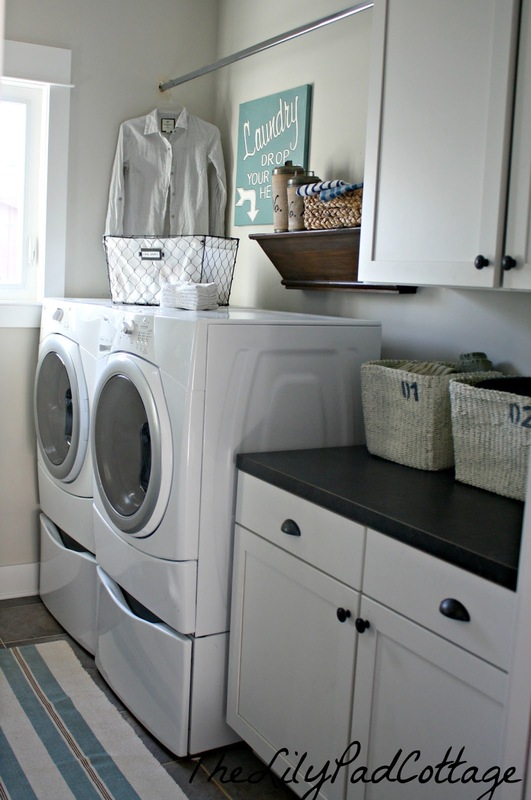 Oh I am having some serious laundry room envy over here! Just found you today through Southern Hospitality and am happy to have singed up to follow you :) Beautiful home. I grew up spending summers on a lake and the pictures of your view are so nostalgic for me. There is absolutely nothing like waking up to sunshine on water in the morning! Hope you have a great weekend! I love your laundry room, Kelly! Featuring you over on the Worthing Court Facebook page at 9am today. Can’t wait to see the doggy bed. Your laundry room is gorgeous. I love all the organizational things you incorporated. Beautiful! Every single little detail! I love the frames on the whiteboard! SO cute! Thank you for sharing your talent with us! I am pinning! What a lovely job you’ve done on your laundry room, it’s beautiful! 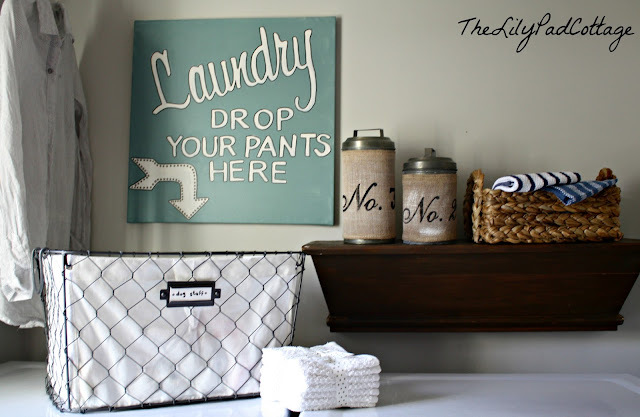 I’ve got this linked to my DIY laundry rooms post too today! Hi! I aspire to have such a functional command center! It’s beautiful! Where did you get the wire paper sorting rack you have hung on the wall? I, too, am working on making our kitchen and laundry/mudroom less cluttered and more functional. I’m going to second Stephanie and ask where you got your wire paper sorting rack that’s hung on your wall – I’ve been looking for something like that for the longest time! Thanks Megan, it’s from HomeGoods! Where did you get the wire holders hanging on the wall? 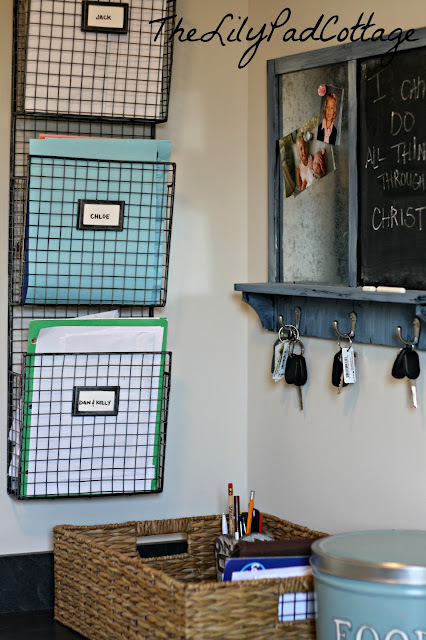 I’m also wondering where you got the metal hanging file/bins on the wall. 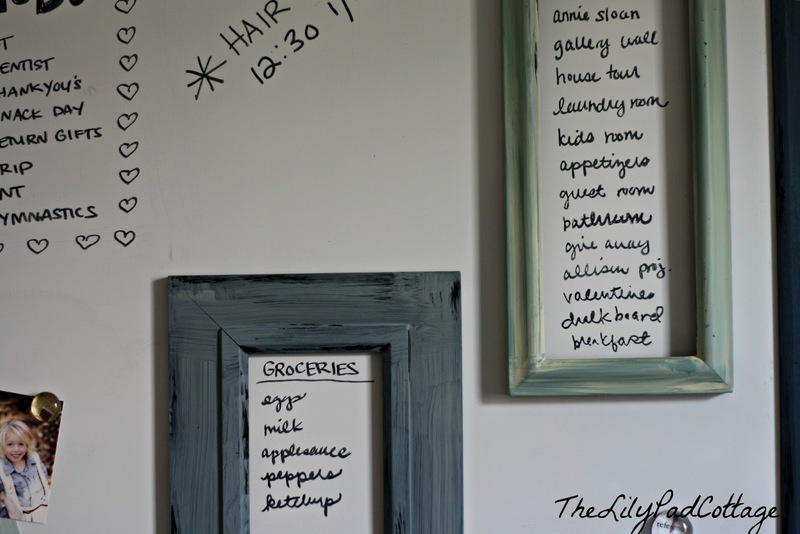 I love them :) great job on your laundry room……I’m inspired to go tackle mine now. Where did you get the hanging file baskets? I have been looking for these everywhere!!! Do you remember where you got that wall mount file organizer?? I need one of those desperately for homework! Can you email me please!